BIDDEFORD — On March 9, the University of New England held a ceremony to dedicate a new, state-of-the-art, eco-friendly building to former UNE president Danielle N. Ripich. A testament to her vision for the university and her devotion to students, the building, located on the Biddeford Campus’ riverfront, is a 60,340-square-foot, three-level, multipurpose facility designed to support students’ everyday needs. It boasts many innovative, ecologically sound features, including bird-safe glass, which was installed at the request of environmentally conscious undergraduates. 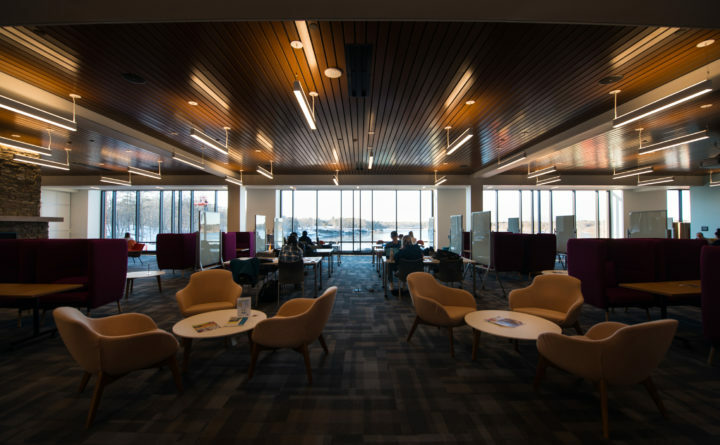 The building’s first floor provides a lounging and socializing area for students, including a sunken living room, a game room, televisions, an abundance of soft seating, a commuter lounge, and a pub. The second floor, connected to the university’s library via a glass bridge, serves as a one-stop center for all things academic, featuring open study space; several small rooms for group study; tutoring services in the Student Academic Success Center; academic advising; career counseling; an informational video kiosk on study abroad opportunities; computer work stations; a separate lounge exclusively for students in the College of Osteopathic Medicine; and an internship office. It also provides a Reflection Room for prayer, meditation and mindfulness. The third floor houses a new dining hall showcasing a Mongolian grill. All three levels feature fireplaces as well as vast windows on the building’s northwestern side that allow for stunning views of the Saco River. Ripich Commons not only reflects UNE’s commitment to the student experience but also demonstrates its dedication to ecological sustainability. Designed in accordance with the highest standards of environmentally-friendly construction, the Commons was built using regionally sourced materials as well as materials with high recycled content. As the result of efforts by students in Associate Professor Noah Perlut’s Introduction to Environmental Studies course, the building will sport solar panels that will provide enough energy to power the campus’ electric car charging station. Other features of sustainability include a special storm water runoff system to diminish environmental impact; ultra-high efficiency mechanical, electrical and plumbing systems, including an energy recovery unit; fully automated, daylight harvesting lighting system; a living green wall, potentially to be incorporated into UNE’s Edible Campus Initiative; and an innovative dishwasher system that reduces water consumption and captures all compostable food scraps. The structure’s crowning glory is its bird-safe glass, covering the entire front façade of the building and both sides of the bridge. The special glass, which uses technology to break up the reflectivity of glass, thereby alerting birds to its presence, was installed at the request of students who petitioned Ripich for its inclusion. According to Perlut, students in his fall 2016 Advanced Field Methods in Avian Ecology and Conservation course reacted strongly to a film he showed them on bird conservation and migration, which featured a segment on bird fatalities that result from traditional window glass strikes. As a result, the students lobbied for bird-safe glass to be incorporated into the construction plans for the Commons. Work will begin in the spring to add outdoor patios, a fire pit and extensive landscaping to the building’s grounds. In the meantime, undergraduate, graduate, residential and commuter students, alike, have been excited to make use of their new commons. In addition to relishing the many amenities it offers, the students are also appreciative of the building’s eco-friendly components. “I think many students are able to enjoy it even more with the knowledge that the building is not harmful to migrating birds,” said Denny. The University of New England is Maine’s largest private university, featuring two distinctive campuses in Maine, a vibrant campus in Tangier, Morocco, and an array of innovative offerings online. Our hands-on, experiential approach empowers students to join the next generation of leaders in their chosen fields. We are home to Maine’s only medical and dental colleges, a variety of other interprofessionally aligned health care programs, and nationally recognized degree paths in the marine sciences, the natural and social sciences, business, the humanities and the arts.